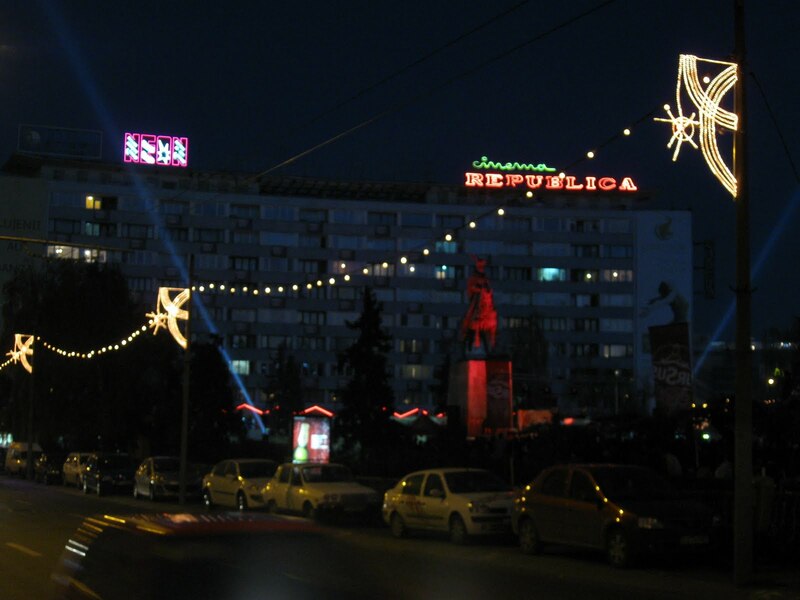 Ever since I arrived in Cluj back in 2008, I have been aware that Christmas in Romania is special. Else, why would so many Romanians have expressed disappointment when they learned I had made plans to return to New Hampshire for Christmas break? Shirl and I had been together at Christmas every year since 1972. I love our New England Christmases together, and I had some misgivings about breaking our 38-year series. But, with Jamie and Amy having tied the knot in Florida late in November, I had already made a special flight to America only a month earlier. Shirl and I talked it over. All our kids are grown. Only Alex (25) is still living in the house, and four of our six would be far away, Christal and Piper in Colorado, where Piper was going to have to work Christmas Day at Aspen Mountain, Brian and Jamie in Florida, where Jamie was also scheduled to work Christmas Day at Sea World, and I would be returning to Campton for the spring term only one month after Christmas. It made sense to stay in Romania. Thus, I had an opportunity between December 24 and 30, 2010 to keep a few promises, and to accept a few long-standing invitations. It proved a wonderful, yummy, busy, somewhat overly liquid, but extremely cordial and happy week. Here is a chronology of my Christmas in Romania, which I record for posterity, so as not to forget. I thank all of you wonderful people for showing me so much love and caring. 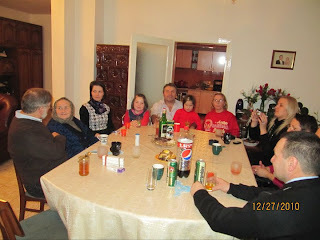 Christmas Eve was enjoyed at the home of Alexandra Muţiu's mother-in-law, Tibi's mom Katalin Kajcsa. Ida (almost 9) and Ingrid (5) were a bit hyper, of course, but absolutely charming in their appreciation of the gift bags that this old Santa brought, filled with chocolate bars, Barbie dolls and stuffed bears. (Both girls got the same toys; Alexandra's explicit request.) It was a warm and joyous evening, featuring Christmas Soup and sarmale. Carolers came to the door of the flat, and I had the pleasure of joining in one of their songs (probably "Jingle Bells," the one English song that all Romanian children know). Both Raluca Tarcea of Cluj and Alexandru Mican of Bistriţa are presently enrolled in the Plymouth State University MBA Program in New Hampshire, and both came home to Romania for Christmas this year. They are both dear friends of Shirl's and mine, and have spent many days and evenings at our home in Campton. So, I found myself with two competing invitations for Christmas Day. 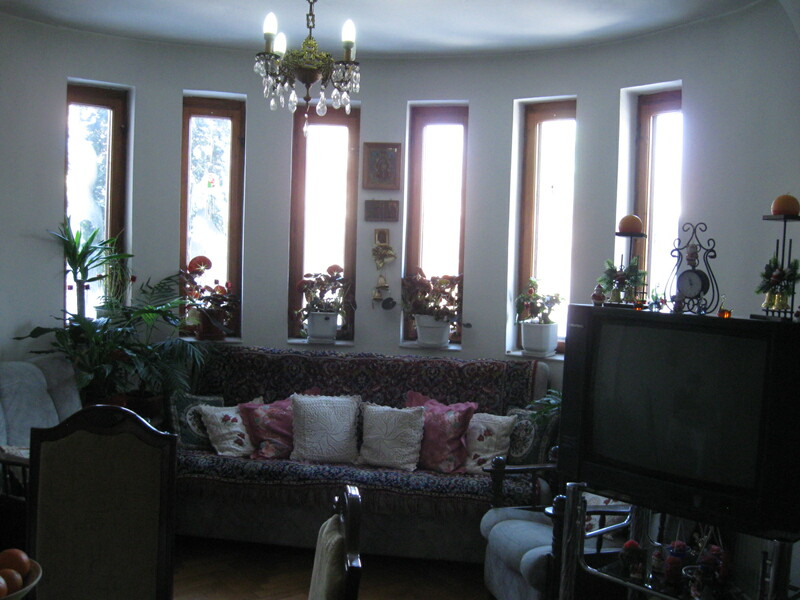 I accepted Ralu's, partly because I had not yet met her parents, and wanted to do so, and partly because it would make logistical sense to visit Bistriţa on my way to Suceava, a few days later, and I could then stay with the Micans for two nights, which Alex had encouraged. Domnule (Mr.) Nicolae Tarcea and Ralu came to pick me up at 2:30, and took me home to a Mănăştur bloc, to their graceful apartment, and to a party that lasted until almost 11:00 PM. Supposedly, there was a lunch and a dinner served. In fact, there was an all-day feast. I think Doamna Nastasia Tarcea had cooked four or five different meats, along with sarmale, Christmas Soup, and a marvelous collection of side dishes and desserts. 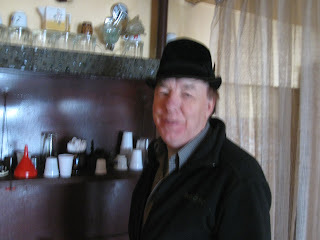 And, Mr. Tarcea opened the Johnny Walker Black Label that I had given him, so we ended the day with "sipping whisky." We sang. We found beloved carols on YouTube and listened. We talked of all manner of things. 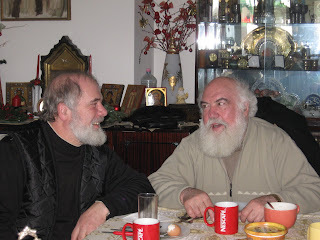 And then, Nastasia showed me the newspaper story about Father Sava, that led to the next weekend's mission to Oaşa Monastery (as described below). All in all, it was a grand Christmas Day. Way back on 29 September, 2008, my first work day in the UBB Faculty of Economics, I met at about 8:00 A.M. a new first-year student from Satu Mare named Valer Olimpiu Şuteu, who was there with his father (also Valer) to launch his university studies. (That encounter was described in the latter part of my post of that date entitled "Faculty Day." 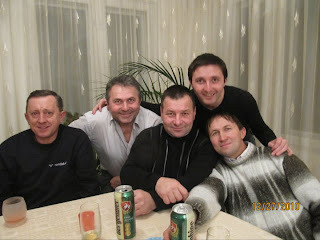 In my quoted letter in that post, you will read of my invitation then to spend Christmas, 2008, with the Family Şuteu.) 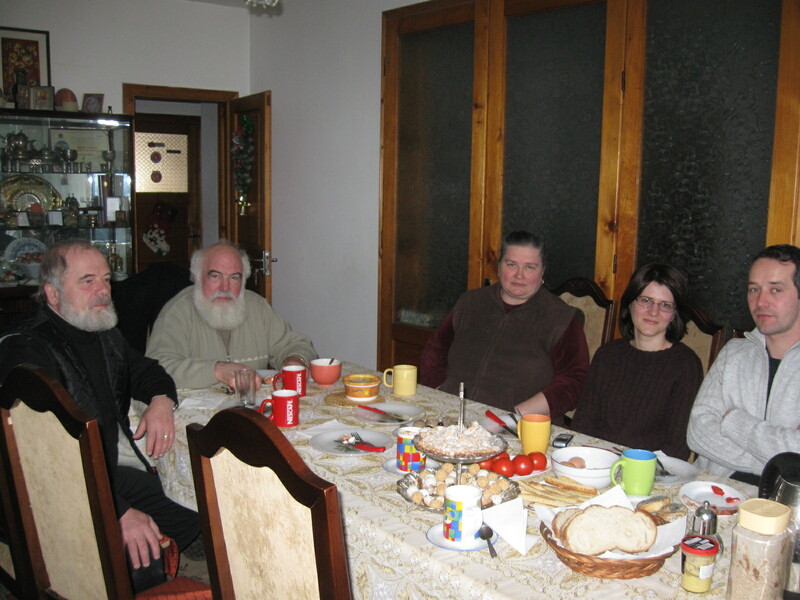 As the chance meeting ended, Mr. Şuteu invited me to stop in to see them in Satu Mare, if ever I made it there. 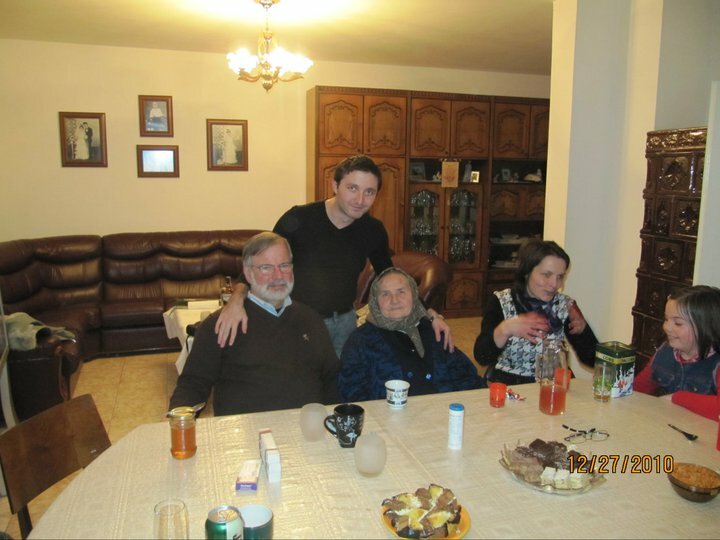 Later that fall, on a visit to the northern counties with fellow Fulbrighters, we met with Mr. and Mrs. (Mariana) Şuteu for a coffee on the drive home to Cluj via Satu Mare and Oradea, from my first visit to Maramureş. Over coffee, we learned that Mr. Şuteu was battling cancer. This fall, he died. Valer had called me to give me the sad news. Now, in December, Valer called again to invite me to come spend some time at Christmas with him and his mother in Satu Mare. It was a small gathering on Sunday at about noon, just the three of us, and the first social event at their home since the loss of Mr. Şuteu. But Christmas love was in the air, and we had another fine meal, although a less liquid one than previously, as Klaus and I were scheduled to drive east to Ocna Şugatag for the night, over the mountains, and in the snow. I made it safely to Popasul din Deal in O.S., and had a small supper in the company of my friend, Vasile Pop. Bedding down early, I slept for eleven hours straight. It was wonderful. In the morning, I tried out the brand new indoor swimming pool, now completed, in a spa featuring also a salt bath and a sauna. The mission was to drive south from Maramureş to the city of Bistriţa. It is only, perhaps, 160 Km. 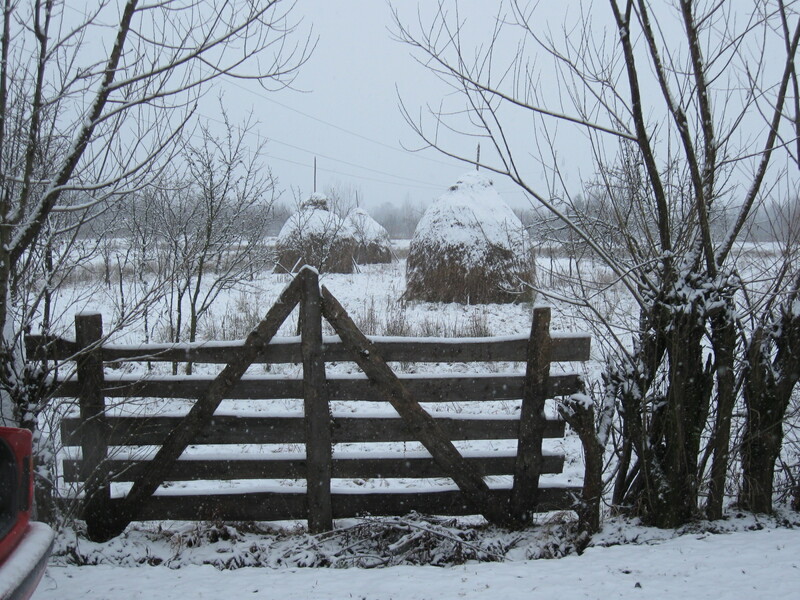 But again, it was over the Carpathians in a snow storm. It went well for Klaus on his new winter tires, but far less well for the three cars seen off the road in snowfields or, in one case, hanging from a bridge with the rear end in a brook. 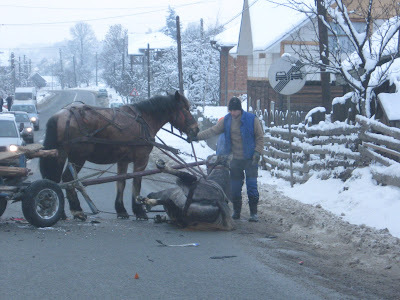 One was being pulled from the ditch by a team of horses with a caruţa (horse-drawn wagon). At the top of the road there is an inn where I had previously stopped for coffee with Connie Goddard. This time, as I walked across the road to the entrance, I was joined by a fellow motorist, also in need of a break. As she was in the lead, I asked, "Deschis?" (Is it open?) I guess I asked in an American accent, for she replied, "I don't know, I'll check." The door was not locked, so we spent a pleasant half-hour over coffee and ciorba, and I made a new friend from Cluj, Lucia S. Lucia is a businesswoman, and proved an erudite conversationalist, and good-hearted sort, typical of those who grew up, as she had, in Maramureş. As for my new acquaintance, Lucia, I hope she will read this blog and e-mail me, for I cannot today find her e-mail address, and would like to be in touch. 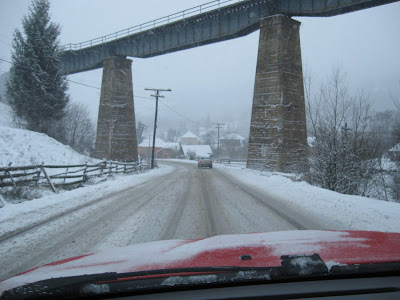 We agreed to drive in convoy down the southern side of the mountains, lest one or the other of us encounter misfortune. The downhill ride went well, and Lucia beeped her "Goodbye" as she turned right and I left, where the road to Nasaud and Bistriţa diverges from that to Beclean and Cluj. Arriving at the house of Mican I was warmly greeted by Claudia and Augustin, Alex's parents, and immediately made to feel at home. A Christmas feast was almost ready, and soon the fun began. It lasted for that day and the next. I cannot tell you how many friends and family I met, but among them were Alexandru's aunts and uncles, grandmother and great aunt, family friends from Braşov, and the assorted children large and small of all. It was a noisy, friendly, joyous occasion. The last evening Alex and I walked the 300 meters over to the Faur house to pay our respects to Dora's family. On the morning of the 29th, I left for the East, myself loaded with good Christmas cheer, and Klaus with a lot more homemade hootch. The road east to Bucovina is now upgraded to European Highway standards, and while far from an autostrada, it is smooth and well marked. Snow was again in the air, but the trip was uneventful, and I arrived in Vatra Dornei on time for my lunch appointment with my former American Studies student, Irina Tarniceru, and her boyfriend Mihai. We ate at the ski lodge at the base of Vatra's ski run, and the similarity to New Hampshire's smaller ski areas was unmistakable. I was pleased to see Irina looking beautiful, and sounding both well and happy. 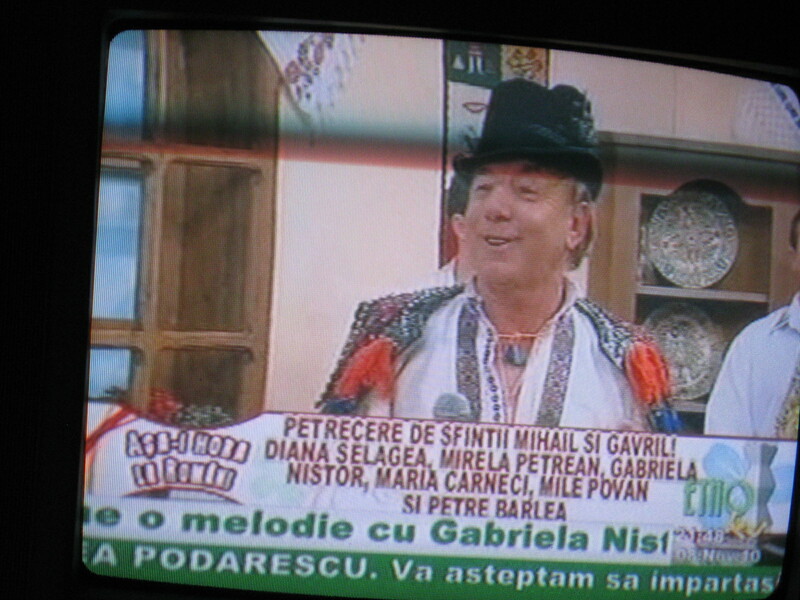 Finally, I would be amiss if I did not report our having seen Vatra Dornei's Goat Dancer and his entourage. 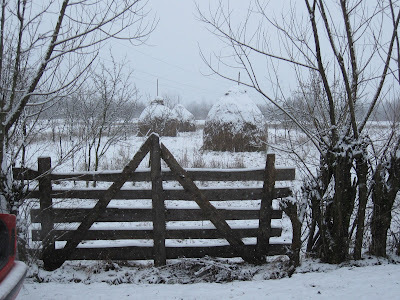 Crăciun in Bucovina! After lunch Klaus and I continued to Suceava, where, after a couple of false starts, we found our way to the home of Mihai and Traudi Moroşan. The Moroşans live in a large and solid home in a lovely part of downtown Suceava, with their youngest son Mihail, a computer science student at Essex University in the U.K. One floor above is the home of one of Mihai's brothers, who paid us a visit Wednesday, and joined in the sumptuous feast that seemed to be on the table from the moment of my arrival until my departure the next day. 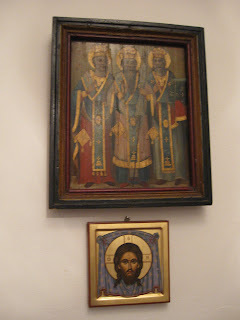 On Thursday, I had contemplated heading south to pay visits to acquaintences old and new in Brasov, Bucharest, and Piteşti before heading home to Cluj, but my departure was delayed by a morning visit from Father Nicolae of Sf. Nicolae's Biserica in Câmpulung (Mihai's younger brother), his daughter, and her fiance. We ended up in an intense conversation/caroling session, during which I learned that Father Nicolae can really sing! It was noon before I finally hit the road, and given the weather and the many hundreds of Km already traveled, I chose to take the familiar road back west to Cluj, and not to stretch my luck by making a long southern loop. 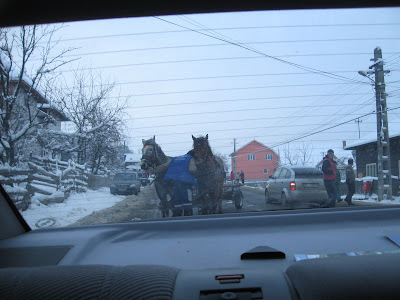 After passing at least twenty horse-drawn hay wagons coming down the highway east of Bistriţa, we came upon one that had had a mishap and blocked the road in a village. I gasped in horror when I came upon this scene, fearing the horse was a goner. But as we passed, the horse was able to get up, and continue with his work. Klaus and I got home safely to Cluj just after dark, where I fell happily into my bed at Economica II. It was a wonderful Christmas Week trip of about 1000 snowy kilometers, and a fine holiday, albeit far away from my own home and family. Thank you, my dear Romanian friends, for making me welcome in your homes, and for allowing me to enjoy the holiday with your families. I now understand what was meant by all those who had told me, "Christmas is a special time in Romania." Glad you enjoyed it !!! To many more to come !